Clone Wars Bloopers: Ep. 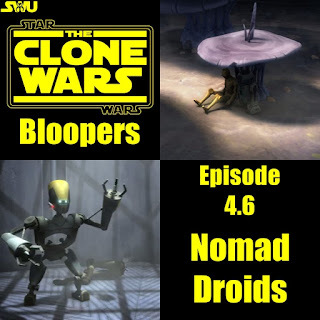 4.06 "Nomad Droids"
This episode was interesting, just not as interesting as you thought it was! It was flawless up until the last couple minutes, that's when it gets wacky... You'll see what I mean! ...but a few seconds later the Droid doesn't appear to be burned at all. Next, When Grievous' ship blows a hole in the side of the Marauder, Maximo is the first to get sucked into space, followed by several Weequays and Artoo & Threepio. Outside you can see Artoo, Threepio and the Weequays floating away but Maximo is nowhere to be seen. and a Gonk Droid in front of Artoo & Threepio. 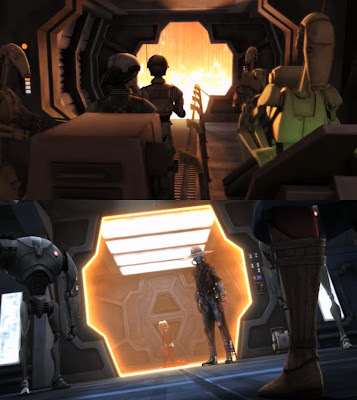 When the Protocol in front turns around trying to resist the incinerator, the Droid behind him is gone. In the next shot he reappears. ...but when Artoo and Threepio come up behind them they are still standing. If you look closely you can tell that the Incinerator room is just a modified version of the Airlock seen in Cargo Of Doom. Big thanks to Anthony for giving me the heads up on most of the bloopers seen here! 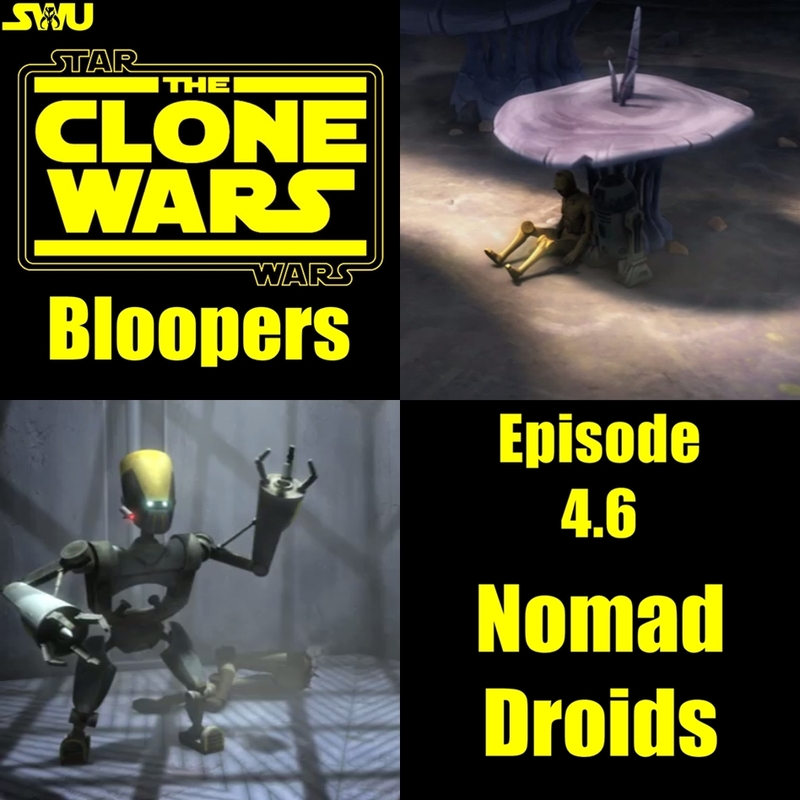 If you enjoyed this edition of Clone Wars Bloopers please use the share buttons below. If I made a faux Pas of my own let me know in the comments. Like the last couple episodes, this one got a lot of mixed reviews. I didn't know what to think about it at first but after several viewings it has grown on me. Like Shadow Warrior, this episode was extremely rushed, especially the climax. But it didn't make it un-enjoyable, the Wizard of Oz and Gulliver's Travels' references were clever and the action, although not plentiful, was awesome. Overall I give this episode a 5.8/10, definitely not the best TCW crew can put out but a worthy edition to an epic series.